Magnitogorsk: Forging the New Man is about the fortunes of three generations living in the shadow of Russia's most breathtaking industrial project of the thirties. The film was inspired by Joris Ivens' Song of the Heroes. In the early thirties, the bare steppes of the Urals were transformed at breakneck speed into a blast-furnace complex, and a city was raised out of the ground - Magnitogorsk. Volunteers from Eastern and Western Europe were involved (including many celebrated "shock-workers"), but most of the work was done by forced labor (there were 35,000 people deported to the site). Magnitogorsk was the model project to demonstrate the energy of the first five-year plan of the Soviet economy. 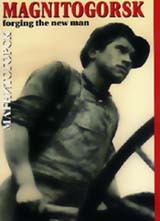 In 1932, Joris Ivens made a film about the building up of the Soviet Union. He chose Magnitogorsk as an example of how the new world and the new man were being forged. His film Song of the Heroes encapsulates the spirit of the prevailing ideology of the time. Magnitogorsk: Forging the New Man goes in search of the past and current ideals of the builders and residents of Magnitogorsk. With fragments from Ivens' film, Magnitogorsk refers to the Zeitgeist of those times. Telling the story of three generations, it shows us what became of the heroes of Ivens' film. It also traces the ideals with which younger generations are now being raised. Uncovers the secret history of Western architects who moved to the Soviet Union in the 1920s and 30s, to design the huge new industrial cities being built across Siberia and the steppes.